Trying to keep the ball away from a close defender, midfielder Christian Lytle passes the ball to a teammate. 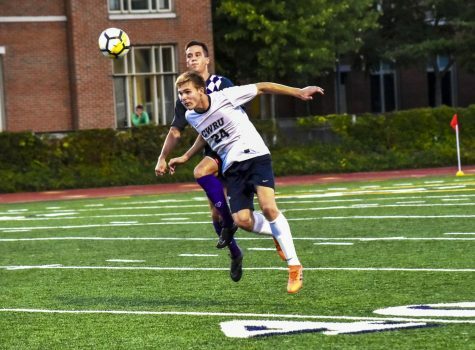 Spartan men’s soccer took both a win and a loss this week, succeeding in shutting out Baldwin Wallace University, 4-0, but failing to do the same for DePauw University, 2-1. They’ll stay at .500 with a record of 2-2-0. 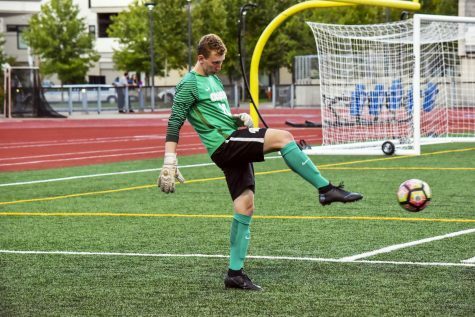 In their handy defeat of the ailing Baldwin Wallace University Yellow Jackets, 0-0-5, four different Spartans put one past the keeper. Second-year defender Alex Besl struck early, scoring within the first six minutes off an assist from third-year teammate Michael Balog. 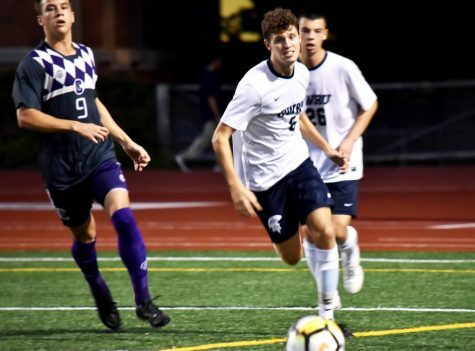 Right before the half, second-year midfielder Brady Daulton stroked home a finesse shot from 15 yards out to send the Spartans into halftime with a 2-0 lead. In response, the Yellow Jackets came out of the half with increased pressure, swarming around the midfield and putting pressure on the back four. 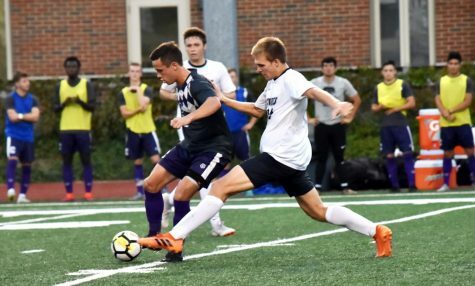 However their efforts saw no goals for their side, while the Spartans’ Joshua Prosser, fourth-year student, and Jake Micham, second-year student, added two more goals to increase their lead two-fold in the last 14 minutes, closing the out the game 4-0. In the impressive goal scoring outing, Head Coach Brandon Bianco saw possible improvement in defense. His advice would hold true as they took on the DePauw Tigers, a team that plays with pace and pressure. The Tigers came out ready to play, forcing mistakes in the midfield and creating opportunities for counter attacks. They dominated the first half, with DePauw forward Zach Hoffman putting them up 1-0 at the 35 minute mark. However, after halftime, the Spartans would match their aggression. After 45 minutes of pressure, DePauw appeared vulnerable. Their players became tired, and their defensive scheme could not match their former energy. On the other hand, the Spartans picked up their play, getting several good looks at the goal. 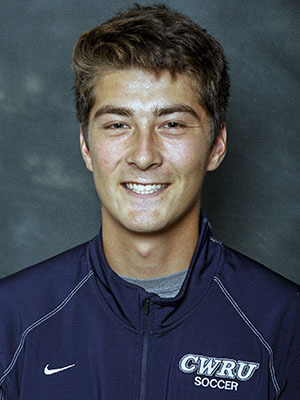 After a few tries, fourth-year midfielder Jacob Grindel struck one in at the 58 minute mark, tying the game 1-1. Both teams battled to pull ahead, but the Spartans had the momentum. 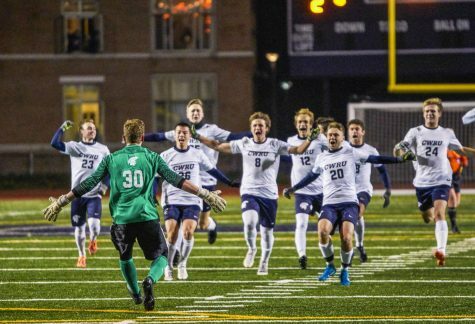 DePauw got several opportunities on goal, but they were dealt with adequately by CWRU’s back four. With less than five minutes to go, both teams still defended hard and were waiting for the breakthrough moment in the game to get into goal. DePauw got that chance on a penalty kick in the 85th minute. Forward Julian Gonzalez stepped up, shot to the left, and scored the goal that put them up 2-1, ultimately winning the game for the Tigers. 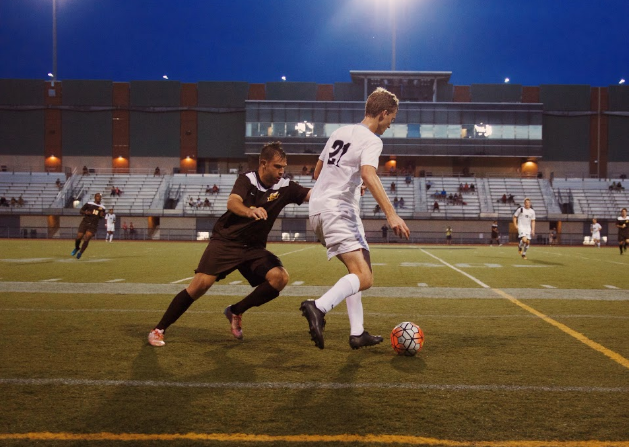 The Spartans men’s team will resume action on the road against Ohio Northern University on Saturday, Sept. 17.